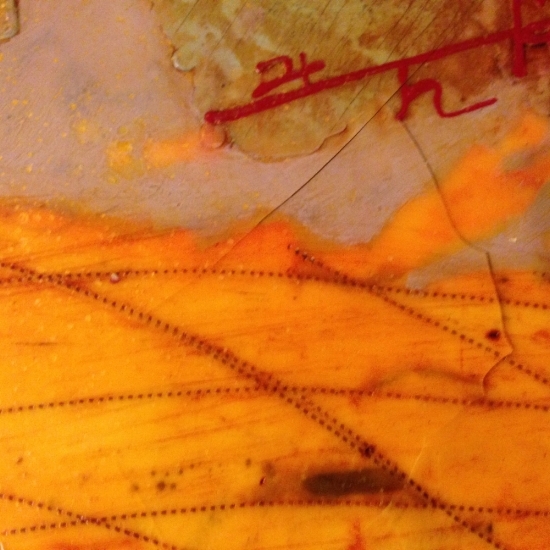 For several years, I have been restoring both my own encaustic paintings and those of art collectors. If you have an encaustic painting or object that needs repair, please fill out the form below. I will need pictures of the damage so I can best assess the damage and estimate how much time it will take. Absolute Horizon II, encaustic and oil on panel, 24" x 70". This painting of mine froze in transit to a client in Washington D.C. during the 2014 arctic blast. It took me 40 hours to fix this piece. This image is of the restored painting that froze while shipping to D.C., the client unfortunately did not want the painting back. Luckily, the initally tragic story of this painting had a very happy ending when it sold soon after through my Seattle gallery to a chemical engineer in Midland, TX.